"This is a perfectly rich, great-tasting breakfast option for that occasional Sunday morning when you don't care about calories!" Whisk 2 cups flour, baking powder, sugar, and salt together in a bowl; cut shortening into flour mixture with a pastry cutter until mixture is crumbly. Mix in egg and milk until incorporated. Turn dough out onto a well-floured work surface and knead for 1 minute. Roll dough out to a thickness of 3/4 to 1-inch thick, cut with a biscuit cutter, and place biscuits onto prepared baking sheet. Brush tops of biscuits with melted butter. Bake in the preheated oven until biscuits are golden brown, 8 to 10 minutes. Cook and stir sausage in a large skillet over medium heat until browned and crumbly, about 10 minutes. Drain excess grease. Stir 1/4 cup butter into sausage until butter has melted and mix in 1/4 cup flour until thoroughly combined. Pour evaporated milk and water into sausage mixture, bring gravy to a simmer, and reduce heat to low; simmer gravy until thickened, about 5 minutes. Season gravy with salt and black pepper to taste. 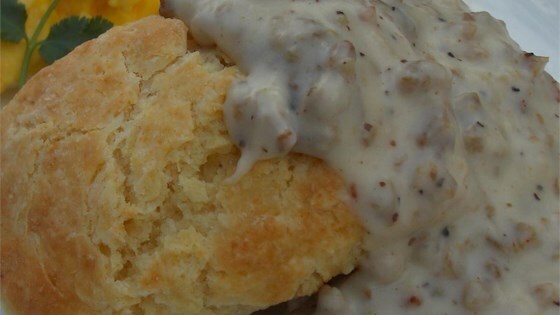 Serve biscuits with sausage gravy. I used another recipe for biscuits but I used this gravy recipe. This is the best gravy ever! Used my own biscuit recipe, but the sausage and gravy were outstanding! Our son told me prior to breakfast that he wasn't that wild about sausage/gravy, but he went back for seconds on this! Great recipe, everyone loved it. Will definitely make again!